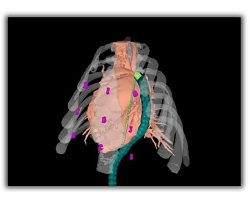 BodySLAM Surgical Image-Guidance: Model-based image-guidance is a method that uses a 3D rendered visualization as a feedback mechanism for navigating surgical tools during minimally invasive surgery (MIS). Our BodySLAM approach recursively estimates the state of a surgical tool in order to render its position in relation to preoperatively reconstructed anatomical models. The algorithm we have developed is novel in that it uses probabilistic filtering algorithms related to those developed by the wheeled mobile robot community. Our BodySLAM approach seeks to improve the accuracy and efficacy of surgical guidance. Papers: 1, 2, 3, 4. 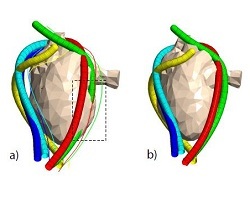 Constrained Filtering: To accurately register a surgical tool to preoperative models for image-guidance, we have developed a probabilistic method that takes advantage of cases when the surgical robot is estimated to be in an infeasible state: for example, when the estimated robot position intersects an anatomical surface model. Because this situation is infeasible, the estimate of the robot position needs to be corrected. 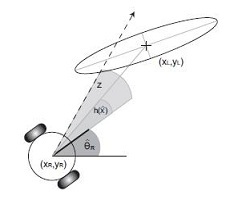 The filtering algorithm we have developed represents the uncertainty of the robot pose as an ellipsoid, and when an infeasible state is detected, the ellipsoid is truncated according to a novel inequality constrained filtering update step that we have developed. As regions of the ellipsoid are removed, eventually the true state emerges. Papers: 1, 2. Bearing-Only SLAM: The bearing-only SLAM problem is the task of mapping the locations of visually detected features in a robot's surrounding environment while simultaneously localizing the mobile robot. The bearing-only SLAM problem is applicable to systems with a single camera. Our work improves upon the typical EKF filtering approach by treating the filtering measurement update step as a numerical optimization problem. We have been able to show that our novel filtering update step prevents divergence of the Kalman state estimate despite the high nonlinearity of this problem. We have also developed a proof that ensures that our algorithm converges to the global minimum of the underlying optimization problem. Papers: 1, 2. Topological SLAM: We have developed a unified filtering framework for hybrid metric/topological robot global localization and SLAM. At a high level, our method relies on a topological graph representation whose vertices define uniquely identifiable places in the environment and whose edges define feasible paths between them. At a low level, our method generalizes to any detailed metric submapping technique. The filtering framework we present is designed for multi-hypothesis estimation in order to account for ambiguity when closing loops and to account for uniform uncertainty when initializing pose estimates. Our implementation tests multiple topological hypotheses through the incremental construction of a hypothesis forest with each leaf representing a possible graph/state pair. Papers: 1, 2, 3. 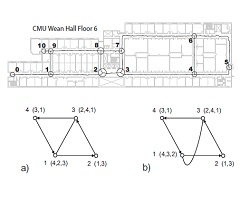 Multi-Robot Path Planning: We have developed a leap-frog path planning algorithm designed for a team of three robots performing cooperative localization. 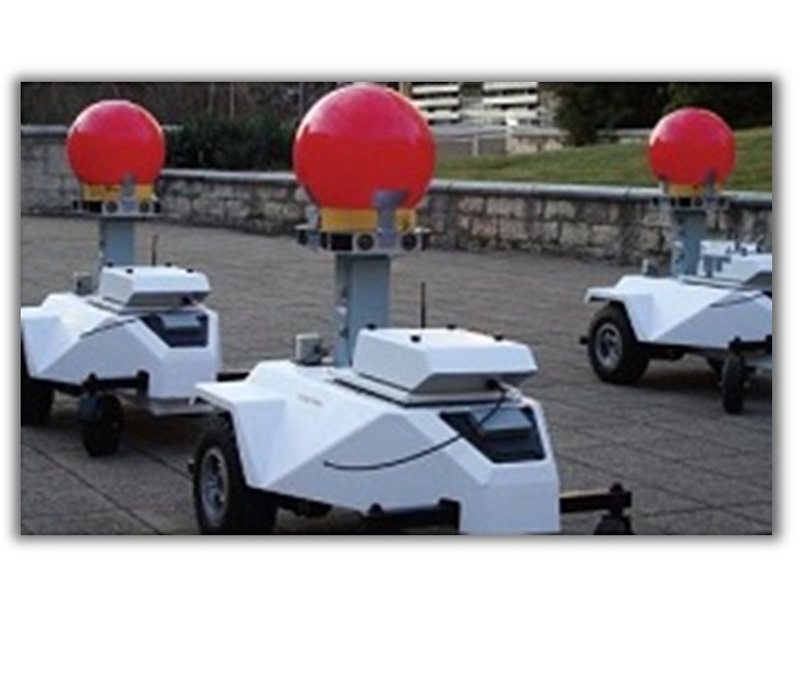 Two robots essentially act as stationary measurement beacons while the third moves in a path that provides informative measurements. After completing the move, the roles of each robot are swapped and the path is repeated. We demonstrate accurate localization using this path via a coverage experiment in which three robots successfully covered a 20m x 30m area. We report an approximate positional drift of 1.1m per robot over a total travel distance of 140m. To our knowledge, this is one of the largest successful GPS-denied coverage experiments to date. Paper: 1.